The foundations of Nei Gong training involve getting the body ready for further work. This helps to develop our health, relax the mind and also ensure that we have an efficient-enough functioning body to move deeper into the practice without the risk of problems arising. We first condition the body, then condition the breath and finally we start to regulate the energetic system. These are classically known as the ‘three areas of regulation’ within the internal arts. Every facet of the way in which we use our body will help us in the early stages of our training. We study the body and its usage through a posture known simply as ‘Wuji’. Every system of Qi Gong and Nei Gong will have their own ‘Wuji’ posture and it is important to understand just how the ‘Wuji’ of your own method works. This is because all other exercises and practices branch out of Wuji making this exercise the root of everything you do. To regulate the body, we relax, stretch, lengthen and open it up to ensure that we take away any ‘irregularities’ and then from here we reshape the body to ensure it is as aligned and prepared as efficiently as possible for our arts. There is a fair amount of work to be done here. It is much like any other practice, we must get the body ready for it. If you were to decide to become a dancer or weight-lifter tomorrow you would have to do a certain amount of ‘body conditioning’ to get your physical form in the right shape. It is no different for an art such as Nei Gong; the only difference is that we build the body in a very specific manner for the internal arts. The breath serves as a ‘bridge’ between the physical and the energetic bodies. It is also the prime way that we regulate the state of our mind in the earliest levels of mental training. It is often said that there should be no work to train the breath in some internal methods, instead we should simply ‘breathe naturally’; this would be okay if our natural breathing was correct but the fact is that many of us breathe is a useless and unhealthy manner! For this reason we must retrain our breathing in several ways so that it can be used effectively for our practice. Through our breath we learn how to govern our level of relaxation, the amount of pressure we use in our practice and also the basis of the process of ‘letting go’. The quality and movement of Qi is obviously of paramount importance for Nei Gong training. We want it to be healthy, functioning well and circulating in the correct manner. In the earliest stages of practice this is all driven according to the lower Dan Tian; an aspect of practice sometimes known as the ‘small water wheel’ of training within some Nei Gong schools. Students are likely to come with irregularities to the way in which their Qi behaves (none of us are perfect!) and so some training must be carried out to sort these issues. 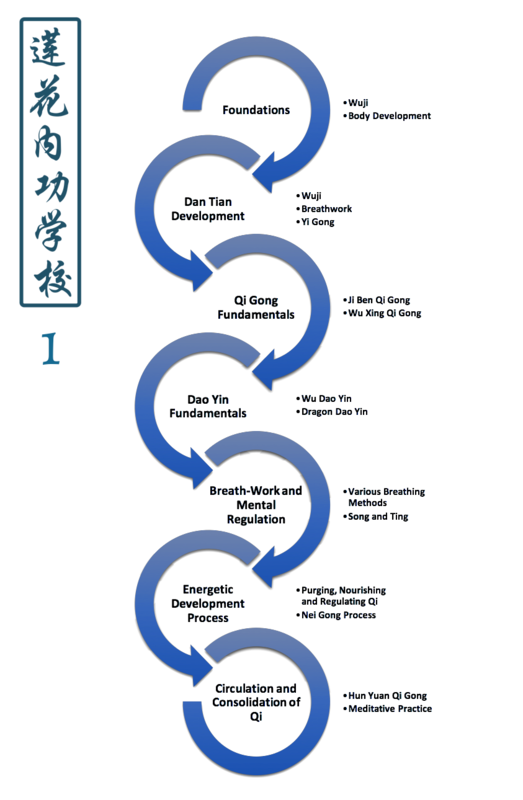 Within the school we use a series of exercises and practice aimed at developing the lower Dan Tian and directing the Qi around the body in the correct and most desired way. We do not use visualisation nor imagination in any way; these are tools likely to lead you astray. Instead we use specific exercises aimed at developing clear and tangible results. Pathogenic Qi is cleared and circulation throughout the channels of the body is aimed for. The Dan Tian is the ‘centre’ for all of this activity in the foundation stages of training and one of our first missions is to locate and develop the Dan Tian in the right way. Many practitioners do not fully understand the Dan Tian and its functioning and so a lot of time is spent in the early stages of Nei Gong training working with this important energy centre. Once the foundations have been laid, students then move on to more complex aspects of training which essentially involve developing the body’s ability to store Qi. Exercises are aimed at developing the ‘gourd body’ which is an internal quality we require to make sure that we can work with the body to develop and sustain a higher degree of Qi. Copyright © Lotus Nei Gong International 2017. All rights reserved.